Cider Mill Press, 9781604330915, 64pp. While there are many self-help books addressing marriage issues, none is as pointed and straightforward as O'Neill's A Short Guide to a Happy Marriage. Like her highly acclaimed short book, Sheltering Thoughts: About Loss and Grief, this book will speak to its readers through its directness and simplicity. It challenges readers to understand and live by the tenets of a committed relationship. 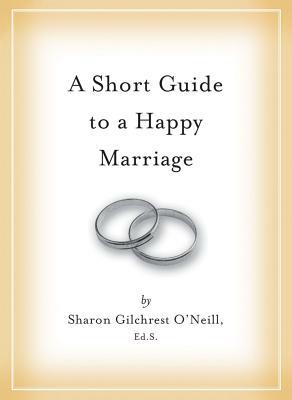 In the spirit of the bestselling book, A Short Guide To A Happy Life by Anna Quindlen, author Sharon Gilchrest O'Neill offers readers the same inviting and simple but sensible approach for embracing marriage, and provides the essentials of a long lasting relationship. Sharon Gilchrest O'Neill, Ed. S, is a marriage and family therapist who has always been obsessed with how and why relationships last. She has been in practice for over 25 years. Her website is www.shelteringthoughts.com. She lives in Westchester County, NY with her husband and son.